by Charles Dickens Author · Gish Jen Author of afterword, colophon, etc.
" Like so many fond parents I have in my heart of hearts a favourite child," wrote Charles Dickens. "And his name is David Copperfield." 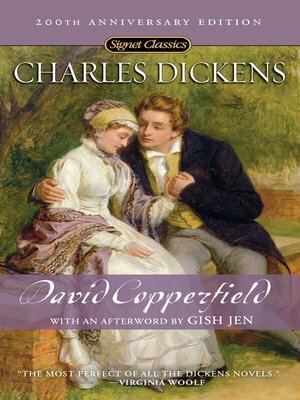 Of all of Dickens's novels, David Copperfield most closely reflects the events of his own life. The story of an abandoned waif who discovers life and love in an indifferent world, this classic tale of childhood is populated with a cast of eccentrics, innocents, and villains who number among the author's greatest creations. acters swarm and life flows into every creek and cranny, some common feelings—youth, gaiety, hope—envelops the tumult, brings the scattered parts together, and invests the most perfect of all the Dickens novels with an atmosphere of beauty." dation for their next publishing venture, Random House. The Modern Library has been a staple of the American book trade, providing readers with affordable hardbound editions of important works of literature and thought. For the Modern Library's seventy-fifth anniversary, Random House redesigned the series, restoring as its emblem the running torchbearer created by Lucian Bernhard in 1925 and refurbishing jackets, bindings, and type, as well as inaugurating a new program of selecting titles. The Modern Library continues to provide the world's best books, at the best prices.